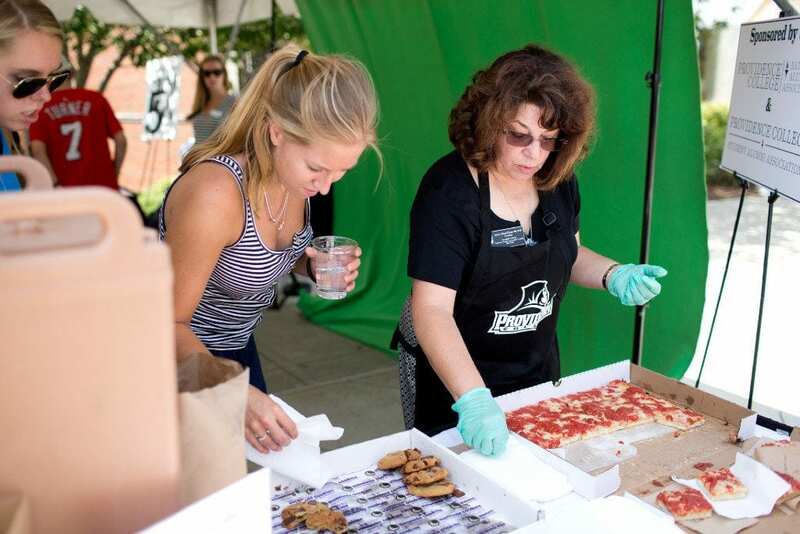 Karen Monti Flynn ’80 & ’15P serves pizza at the reception area for new students and their families on move-in day in August. Providence College was the only college Karen Monti Flynn ’80 & ’15P ever wanted to attend and the only college to which she applied. Her “Friar high” has never waned in her four decades-plus association with PC. “If they need me, they call me. I am happy to help the College as an alumna,” says Flynn, who began a one-year term as president of the National Alumni Association Council on July 1, 2017. An accountancy major at PC, she seemingly has served her alma mater in every conceivable way since graduating. Flynn has scaled the NAA Council ladder, progressing from secretary, treasurer, vice president, and now, the leader of the 56,000-strong alumni association. She volunteered annually for years in class phonathons, served as a class agent and co-chair of her class’s Reunion Committee, and is a season ticketholder for men’s basketball and ice hockey. It’s no surprise she received the NAA’s Service to the Alumni Association Award in 2015. Flynn’s daily modus operandi — instilled at PC — of “giving my best in all that I do,” is clearly reflected in her professional life as well. A senior loan officer at Homestar Mortgage, Inc. in Providence, she is an astute business manager with extensive financial expertise in multiple areas, including residential mortgage lending, loan origination, profit and loss forecasting, and merger integration. For the past seven years, she has been the recipient of the Five Star Mortgage Professional award, an honor earned by only 3 percent of the mortgage professionals in the U.S.
During the course of a 35-year career in the banking and financial services industries, she has served a half-dozen institutions, several as a senior executive. Most recently, she was a vice president and senior vice president with Centreville Savings Bank and also served in those roles during a 17-year term with the Fleet Boston Financial Group, now Bank of America. 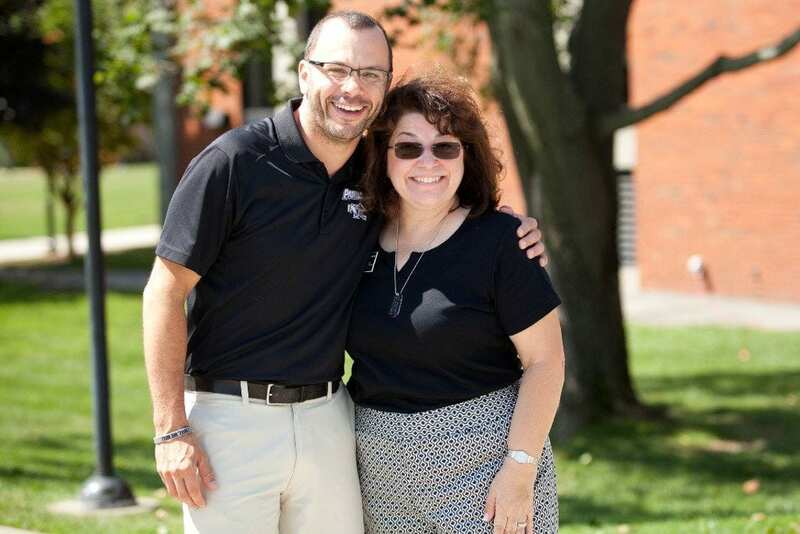 Derek Alfama, assistant women’s ice hockey coach, greets Karen Monti Flynn ’80 & ’15P on move-in day. Flynn and her husband, Kevin J. Flynn, live in North Kingstown, R.I., and are the parents of Christian M. Flynn ’15. What brought you to PC? To be the first female in my family to graduate from Providence College! Many uncles on both my mother’s and father’s sides of the family graduated from PC, and at the time, PC was an all- male school. The minute that changed to allowing women … PC was my first choice. PC was my only choice! I applied early decision and was accepted. I truly have no idea where I would have attended college if I was not accepted to PC. Since I graduated, many cousins continue to keep the legacy alive, as well as my son, Christian, who graduated in 2015. Your son attended PC, graduating in 2015. How was his experience different from yours, in the late 1970s? How was it the same? Different: Many more academic options and extra-curricular activities are available to undergraduate and graduate students today vs. back in the late ’70s. Not to mention the amazing facilities and many intramural sports programs: Concannon Fitness Center, Ruane Center for the Humanities, School of Business. There is something for everyone at PC. Same: PC continues to teach the same Dominican values to its students, whether it was when I was an undergraduate or during my son’s years at PC. PC teaches a life to be filled with meaning and purpose, which at the end of the day is what is truly important. Both my son and I have lifelong friendships with fellow classmates … and when the Ladies of ’80 get together, it is like we were undergraduates all over again. Much joy and laughter occurs when we are together! You studied accountancy at PC. Did you have Gus Coté in Harkins Hall? What do you think of the new business school? Yes, I did have Gus Coté as a professor for a year of taxes; loved every minute of the class and his teachings. The Arthur and Patricia Ryan Center for Business Studies is remarkable with its unique classrooms, state-of-the-art technology, and its unique way of fostering learning in its environment. I truly would have enjoyed all of my accountancy and business classes at the School of Business! Laptops, smartboards, graphics today … just pens and notebooks in my day! What’s the most important way that any PC alum can give back to the College? Come back to the college, see the transformation, and know that without alums who have donated their time, talent, and treasure, PC would not be the special college it is today! Alums can also give back by networking with students. It means so much to the student; it most definitely will have a positive impact on the student but also the alum! The students at PC are intelligent, confident, and ready for an opportunity. How exciting it is to meet them and try to help them as they embark on the next journey in their lives! You never know how much of an impact a cup of coffee or a conversation with a student or an alum who is interested in a career change will do for you and them. It’s the life of meaning and purpose brought to its forefront. Bottom line: Return to PC, attend an alumni event in one’s hometown, meet the undergraduates … and enjoy the memories you will make then and now! What one principle that you acquired at PC do you live by today? I try to give my best in all that I do. PC taught me that you can achieve all that you wish to do; there isn’t anything you can’t do. You can take risks — it is part of life. For every disappointment comes joy. Most importantly, having family and friends to share in your successes and failures makes me who I am. I am proud to be a Friar. PC is my second home. I am so grateful for having graduated from this wonderful academic institution. I LOVE PC! Go Friars!